At Eurovision, A Dance Around Human Rights : The Two-Way As Eurovision 2012 captivated Europe this weekend, human rights in host country Azerbaijan also got the spotlight. Sweden's Loreen, the winner of the Eurovision 2012, performs at the Grand Final of the song contest in the Azerbaijan's capital Baku, early on Sunday. 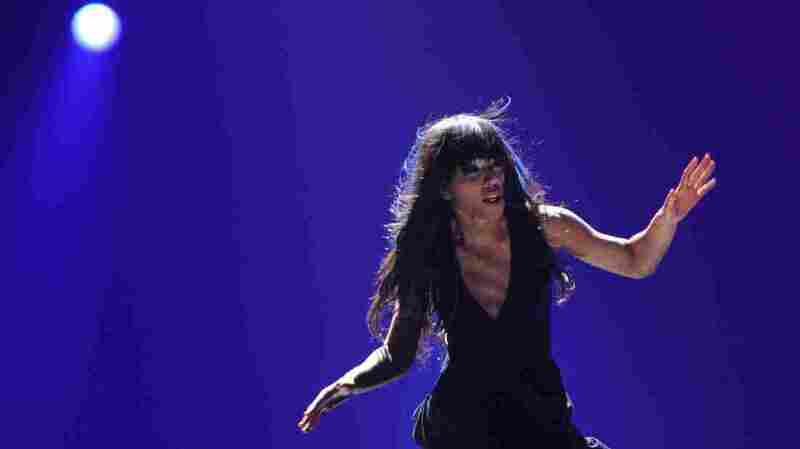 Under flashing lights, Swedish singer Loreen danced barefooted to first place in the 2012 Eurovision competition early Sunday morning. The contest's backdrop: Baku, Azerbaijan. While Europe fell in love with Loreen's song, "Euphoria," stories of abuse on the streets were leaking out. The competition is 57 years old, and as The Associated Press reports, is viewed by about 125 million people worldwide. The AP says it's "hailed by its legion of devoted fans as harmless, kitschy fun that allows Europeans to forget their differences and economic troubles for at least one night." "Human rights are violated in Azerbaijan every day. One should not be silent about such things." "Hosting Eurovision means the Azerbaijani government can showcase Baku to thousands of visitors and millions of television viewers. However, the event is overshadowed by the illegal evictions, expropriations, and demolitions for hundreds of local residents forced out of their homes." "To be very frank I think evictions are taking place everywhere. It is more about the way that you're doing it, about proper procedures, proper compensations and here I can't comment because I don't know but again, when the Olympic village was built in London there were evictions as well and you had heavy protests." The government denies the evictions were related to the Eurovision arena, the BBC reports. Criticism of the government hasn't been isolated to Eurovision-relation actions, however. On Wednesday, an independent human rights expert for the United Nations urged Azerbaijan to spend more of its "considerable wealth" on health care. Thursday, the European Parliament stated the country should "step up reform efforts in all areas of the judicial system, including prosecution, trial, sentencing, detention and appeals." The U.S. State Department calls the human rights situation "poor:"
"... especially with respect to freedom of assembly, freedom of expression, the administration of justice, and the respect of property rights." "Journalists in Azerbaijan continue to suffer violent attacks in retaliation for their work as impunity for their attackers endures. Investigative and critical reporters find themselves the subject of smear campaigns, including in the state-controlled media, designed to stop them from illuminating inconvenient or embarrassing government truths." "Azerbaijan's U.N. Ambassador Agshin Mehdiyev, the current Security Council president, denied any repression of the media, telling a news conference Thursday that 'We have a free press. ... We don't have any people imprisoned because of their professional activities or political views.'" As Eurovision played to its finale this weekend, activists saw the spectacle as a chance to shine a light on their cause. Human Rights Watch said more than 70 peaceful protesters were detained. The AP reports three demonstrators received jail terms of five and six days, and 17 others were fined $25-32.